Camayan Beach Resort is a beautiful luxury escape destination where the forest meets the sandy shores of Subic Bay in the province of Zambales, Philippines. Located at the very end of the Subic Bay Freeport Zone, this hotel is where thousands of both foreign and local tourists choose to spend their family vacations every ear. 1) Beautiful beach view: Of all the hotels in the Subic Bay area, this hotel has the longest beach and the most beautiful view. There is plenty of white sand, moderate ocean waves, and a nice mountain background to make the scenery look especially enticing. 2) Delicious and affordable food: The hotel's restaurant, The Reef, has a nice mixture of both western and Filipino food and features a cocktail bar. You can eat in the restaurant itself, which faces the bay, or you can eat in one of the property's many beach side huts known as "kubos". You can also order room service and eat inside your room. The average meal for one person costs around 300 PHP (or around $7 USD). 3) Close to Zoofari and Ocean's Adventure: Camayan Beach Resort is located just minutes away from Zoobic Safari, which gives guests a mini-trekking experience to see exotic, wild and semi-domesticated animals in their simulated natural habitat; and Ocean Advernture, first Open Water Marine Theme Park in Southeast Asia. 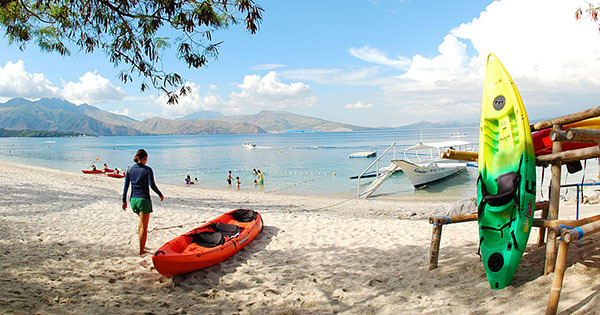 If you are planning to visit one or both of these tourist attractions, Camayan Beach Resort is the best hotel to stay at! 4) Comfortable rooms: The hotel has 85 rooms, and all are modern and very comfortable, although the bathrooms are a bit outdated. But overall, the rooms are in great condition with air conditioning, flat screen TVs, mini refrigerators, and comfortable beds. The walls are also thick enough whereas you would not really hear your neighbors unless they are exceptionally loud.